SAN ANTONIO - A man who allegedly made threats to San Antonio theaters was taken into custody on an outstanding felony warrant Sunday. 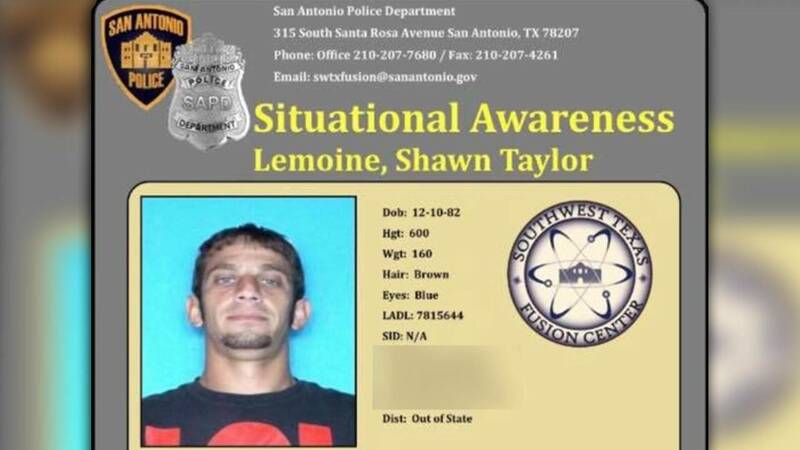 Shawn Taylor Lemoine was arrested in the 3900 block of Fredericksburg on Sunday, but the San Antonio Police Department and the FBI are still investigating a threatening post he made against local theaters. A screenshot of what appears to be a "situational awareness" bulletin shared with KSAT-12 states West Monroe officers in Louisiana alerted authorities with SAPD's Fusion Center of "alarming statements" Lemoine made on Facebook. KSAT-12 has reached out to SAPD, BCSO and the FBI to verify the authenticity of the bulletin, but authorities did not immediately respond Sunday. The bulletin states Lemoine posted a photo of an assault rifle with the words "Theater's coming soon!" "Lemoine did not make a direct threat to a specific establishment, or person in San Antonio," the flyer said. "Officers are advised to be vigilant in areas where theaters are present." The flyer was circulated on social media over the weekend. People told their friends and family to steer clear of theaters, but Sergeant Michelle Ramos with SAPD confirmed Lemoine was in police custody on Sunday.